The growth of home prices is often measured by comparing one year or month to another, sometimes over several decades. It’s rarer for analysts to look back towards the turn of the previous century or further. But a team of researchers from Germany recently took that kind of long view on house prices in 14 advanced economies, including Canada’s, in a number-crunching exercise they say is the first of its kind. The work is presented in the report “No Price Like Home: Global House Prices, 1870-2012,” published in the February 2017 issue of the American Economic Review. The paper suggests there’s a fundamental trend bridging housing markets as varied as Australia and France — and many in between. “Real house prices stayed constant from the nineteenth to the mid-twentieth century, but rose strongly and with substantial cross-country variation in the second half of the twentieth century,” write researchers Katharina Knoll, Maritz Schularick and Thomas Steger. The cause, they suggest, largely has to do with land values. “Rising land prices explain about 80 per cent of the global house price boom that has taken place since World War II,” the researchers continue. Two common views on how — and why — land prices fluctuate are in the report. One, “the classical position,” argues that the supply of land decreases as economies grow and prices rise in response — the law of supply and demand. “The opposing view is that land is still in ample supply so that house price increases trigger a supply response which brings prices down again,” the report outlines. 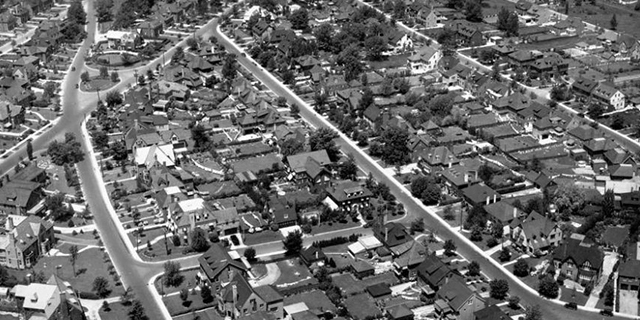 Researchers say their findings “indicate the significance of the classical view,” given the general trend in post-World War II home price gains they have observed. Exactly how much of an impact the price of land played on dwelling values varied from country to country. 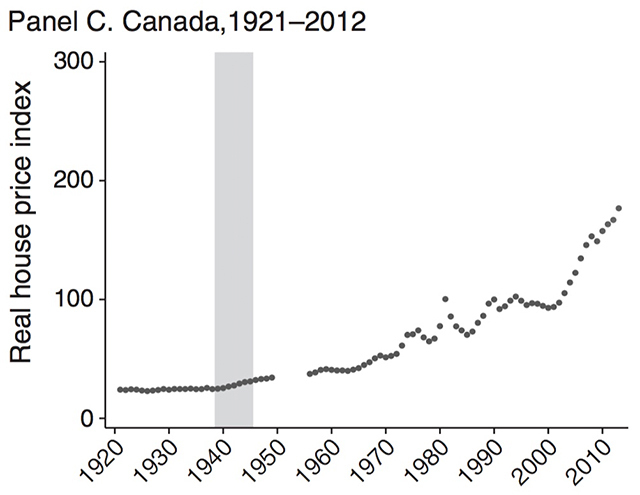 Land prices contributed 95 per cent of the historical house price growth in Canada going back to 1921. Only in Finland did land prices play a bigger part at 96 per cent, and in no country did land values contribute to less than 73 per cent of the long-run gains in house prices. The report doesn’t present inflation-adjusted dollar values for each year, so real estate buffs won’t be able to find the median price for a Canadian home during the Depression or anything like that. However, prices are traced with an index, presented in chart form, for each of the 14 countries examined. To create these indices, researchers pored over more than 60 sources, from extant tax records and real estate board data to the work of financial historians. Below, see how house prices have evolved in Canada and other nations over the past century of so.